With November’s theme worldwide on “Chance,” poet, performance artist, and papercut artist Anja Notanja Sieger of La Prosette shares her personal story and talks about how leaving room for the unknown is such a crucial part of the creative process, from living with sacrifice or regret to surprise as a form of career plan. Anja Notanja Sieger received her BFA in printmaking and creative writing from Kansas City Art Institute in 2009. After graduation she worked for a year building puppets at Paul Mesner Puppets in Kansas City. In 2008 she was awarded a summer fellowship at the Oxbow School of Art in Saugatuck, Michigan. She served as an arts administration protégée for the Milwaukee Artist’s Resource Network’s 2011-12 season. Her live stories have won Milwaukee area slams held by Ex Fabula and the Pfister Hotel. 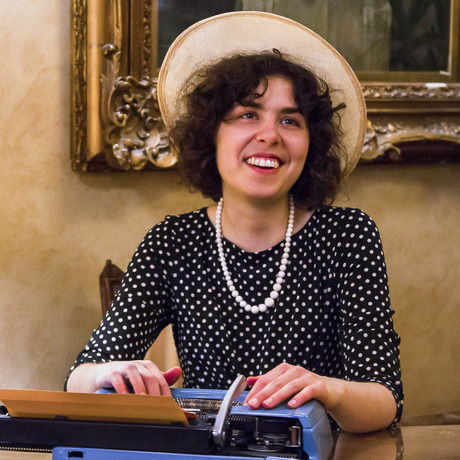 Her performance writing art service La Prosette has been featured on the front page of the Milwaukee Journal Sentinel, USA Today Online, MSN Hotmail News and Yahoo News. Sieger has written about art online for Art City, All Creativelike, Library As Incubator and the Cowbird Daily Story. From 2013-14 she was an artist-in-resident at In Tandem Theatre and a writer-in-residence at Renaissance Theaterworks. The Charles Allis Art Museum, Racine Art Museum, Beulah Brinton House in Bay View, Oakton Community College in Illinois, Milwaukee’s Tenth Street Gallery, Narthex Gallery and Gallery 2622 all recently displayed her work. Currently she serves as hotel narrator for the Pfister Hotel.